Synopsis - Left Neglected is the story of Sarah, a high-powered executive and mother of three, who has a car accident and suffers a catastrophic brain injury. The brain injury results in Left Neglect Syndrome — a disability where she doesn’t recognize anything on the left side, even her own hand or leg. My thoughts - I had extremely high hopes for Left Neglected because it got such great reviews. Unfortunately, this book did not live up to my expectations. This was the first book in a very long time that I actually skipped pages. I never felt a connection with the central character and by the end of the book, I just didn't care what happened to her. I think the author went over the top with her portrayal of the modern career woman. 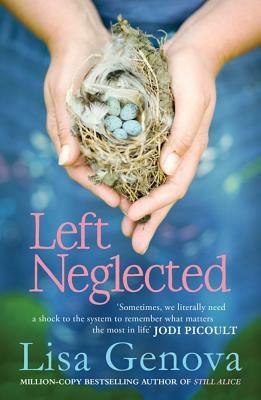 The main character is in a major accident and misses her Blackberry just as much as she misses kids (maybe more)? I got the point, but did I have to be slammed over the head with it? At first I related with her as a mother and as someone who had a career and knows what it's like to work long hours (even though I've never done both at the same time), but after a while it became too much about her career over her family and it made the character unlikable and the story implausible. In the end, I was bored and just wanted to finish it so I could move on to something else. As a side note, I noticed this book has shown up in the genera of 'Chick Lit' and maybe that's the problem - It's seldom I like 'Chick Lit' it's not my thing. If you are a fan of Chick Lit, you may feel differently. It got great reviews, but just didn't work for me.